Each chocolate purchased gives back 100% of the net profits to animal rescue foundations around the country. 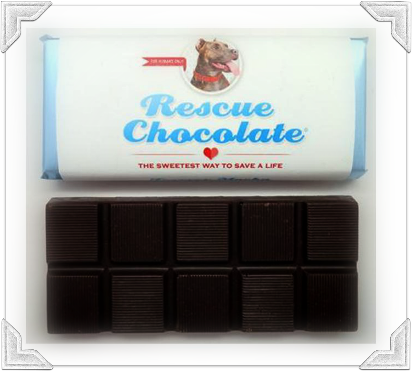 Rescue Chocolate is the sweetest way to save a life and we love the founder Susan. Made of the most delicious, Belgian, chocolate in Brookly NY. Zero artificial ingredients and preservatives in assorted vegan organic flavors. What is better than that! Organic and Fairly Traded Chocolate Bars $7. ea. Boxed sets $20. Single minis $2. Forever Mocha, a striking and velvety pastiche of coffee and hazelnut! Ingredients: 66% Organic dark chocolate (cacao beans, cacao butter, pure cane sugar, soy lecithin, vanilla), hazelnut praline (hazelnuts, brown sugar), sugar, coffee. 2 oz. Peanut Butter Pit Bull sgl minis $2. Boxed 8 pc. Cookies N Cream BonBons $20.